Merciful Lord, cast the bright beams of Your light upon Your Church that we, being instructed in the doctrine of Your blessed apostle and evangelist John, may come to the light of everlasting life; for You live and reign with the Father and the Holy Spirit, one God,now and forever. Amen. 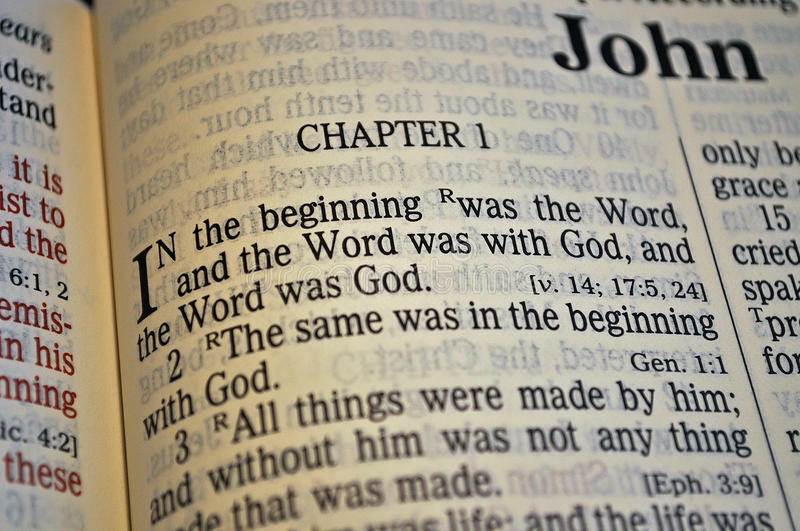 1 In the beginning was the Word, and the Word was with God, and the Word was God.2He was in the beginning with God. 3 All things were made through him, and without him was not any thing made that was made. 4 In him was life, and the life was the light of men. 5 The light shines in the darkness, and the darkness has not overcome it. 6There was a man sent from God, whose name was John. 7He came as a witness, to bear witness about the light, that all might believe through him. 8 He was not the light, but came to bear witness about the light. 9 The true light, which enlightens everyone, was coming into the world. 10He was in the world, and the world was made through him, yet the world did not know him. 11He came to his own, and his own people did not receive him. 12But to all who did receive him,who believed in his name, he gave the right to become children of God, 13who were born, not of blood nor of the will of the flesh nor of the will of man, but of God. 14And the Word became flesh and dwelt among us, and we have seen his glory, glory as of the only Son from the Father, full of grace and truth. Reflection: My wife, a chemist and scientist, once pointed out to me that physically you can bring light into the darkness, but you can not physically bring darkness into the light. I can cup my hands like making a snowball so that the interior is darkness and I open my hands and the dark dissipates. But we can spiritually bring darkness into the light. In fact, by nature, separated by sin from the Lord, we are darkness (Ephesians 5:8). Into the darkness the light shines, Jesus Christ. This is the great theme of Apostle and Evangelist remembered this day in the Scripture the Lord breathed into him to write. The Gospel above is the appointed Gospel reading for the last service of Christ Mass Day. It is the light of love’s pure light, Jesus Christ, the dark world needs and yet knows not Him. This is the light of His Word made flesh that His Church is to shine in the world. There can be no fellowship between light and darkness. No compromise because once compromised the darkness prevails under the guise of light. Almost as frightening as being in the darkness of sin and death is living in the twilight zone. In the shadows, the devil lurks. What is the Lord’s response? Lord Jesus Christ, we implore You to hear our prayers and enlighten the darkness of our hearts by Your gracious visitation; for You live and reign with the Father and the Holy Spirit, one God, now and forever.